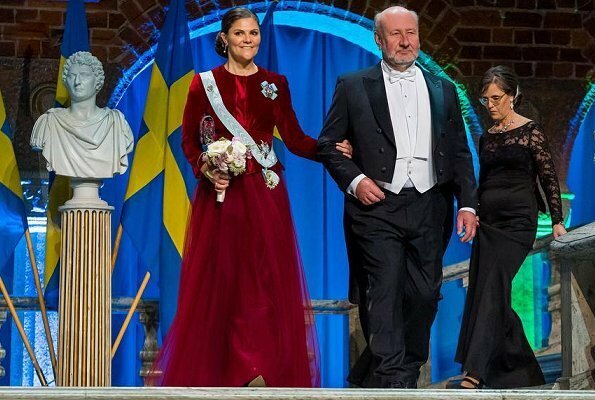 On January 28, 2019, Crown Princess Victoria of Sweden attended the Royal Swedish Academy of Agriculture and Forestry's formal gathering held at Stockholm City Hall. She presented also the Academy's medals. The evening ended with a banquet in the Gilded Hall. The Royal Swedish Academy of Agriculture and Forestry (KSLA - Kongl. 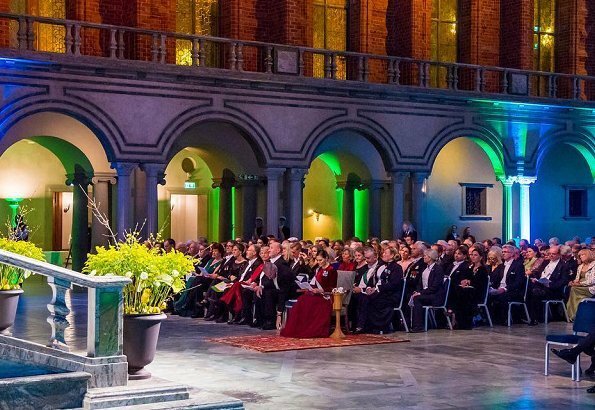 Svenska Landtbruks Academien) is a free and independent organisation that works with issues relating to agriculture, gardening, food, forests and forest products, fishing and aquaculture, the environment and natural resources. Victoria looks beautiful. I love the way her dress is cut to give it a hint of a fairytale look. The color suits her. Fairytale look - that is my Impression too! 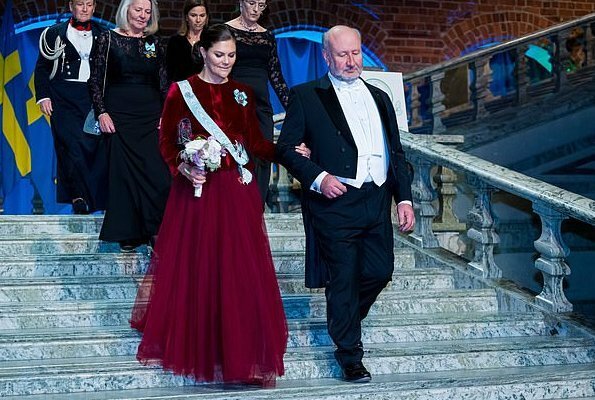 I love the rich cranberry red color, and for me this gown is almost perfection -- the top part is beautiful, and the skirt would be also if the sheer overskirt were removed. I hope we will see this on Victoria again, with that one alteration (and maybe some glorious diamond or ruby earrings :-). What a gorgeous dress in a glorious colour, though I agree that removal of the overskirt might improve it further. One of her nicest formal gowns.